“Java is everywhere” is the official statement pertaining to the platform, and that’s as true as the sky being blue. The technology exists from within simplest of things to desktop computers, smartphones, tablets and whatnot. The usefulness of Java cannot be denied even in the slightest, either, since it’s the driver for delivery of a lot of content. It seems rather odd, then, that you’d want to disable something as useful as this. There’s a good reason for that, however, that we’ll discuss just past the jump. Just a couple of months back, a vulnerability exploit was discovered in Java’s latest version, exposing modern web browsers like Chrome, Firefox, Safari and Internet Explorer on systems running Java Virtual Machine. The exploit was deemed a zero-day one, meaning that it’s so new and unique that it hasn’t been evaluated what the full extent of potential damage could be. Even though the exploit was patched later, another one popped up, and then another one. If you don’t happen to use Java based web apps, the best preventive measure recommended by security experts, for all such scenarios, is to disable the trouble agent altogether, which in this case, translates to disabling Java for your browsers. In this post we’ll tell you how to disable Java for Chrome, Firefox, Safari and Internet Explorer. It should be noted that if you’re using Windows, you can disable Java all across your operating system in one go, for which we recommend you skip to the end of the article. For Mac users, the process is slightly trickier, as it requires disabling Java for each browser individually. For Chrome, you need to launch the browser’s plugin manager. In the omnibar, type chrome://plugins and hit Enter/Return. In the window that opens, locate Java and hit the Disable button, if it’s enabled. Restart the browser afterwards. 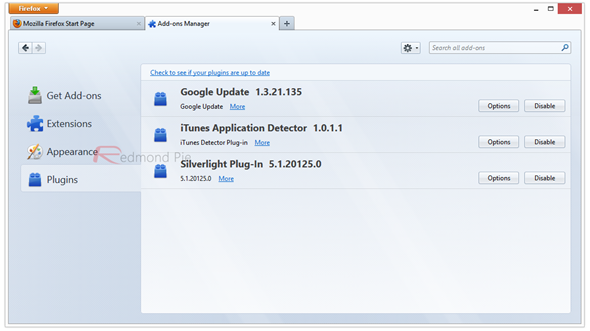 For Firefox, you need the Add-ons manager for this purpose. 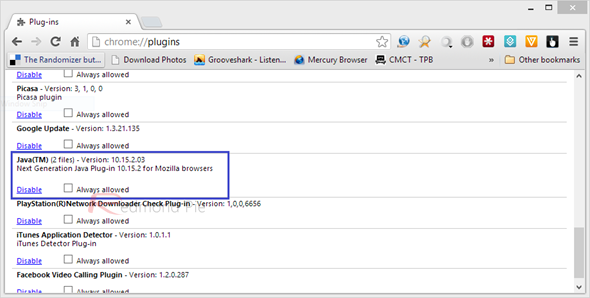 From the Firefox button on top of the browser window, navigate to Add-ons, and then to the Plugins tab. Disable all the entries for Java that exist there (the number may differ for Mac and Windows platforms), and also, if you don’t have Java installed, then the Java entry won’t show up there. As before, restart the browser after performing the change. Safari holds Chrome in the Preferences pane. Launch the Preferences pane, and move to the Security tab. Under Web Content, uncheck the setting that says “Enable Java”. Restart the browser. If you’re using Microsoft Windows, you don’t have to do the process manually for each browser. Instead, you can do it all in one go, including for Internet Explorer. 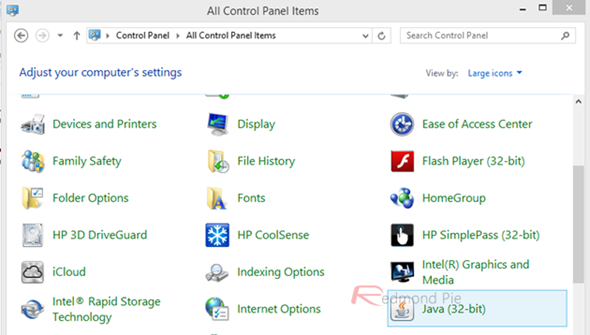 In Control Panel, find Java and enter the settings. 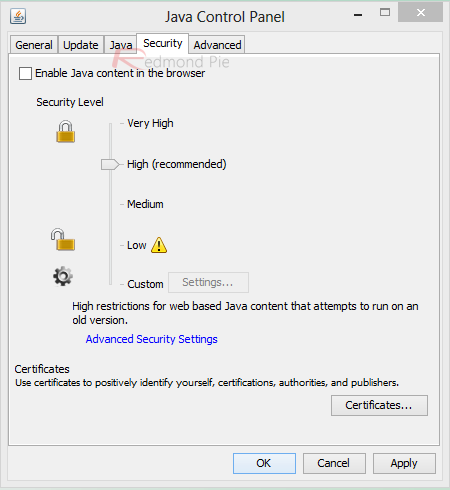 In Java Control Panel, go to the Security tab and uncheck “Enable Java content in the browser”. Hit Apply when done, and restart your computer for safe measure. That’s it. Until a reliable fix is discovered that can last for long, it’s advisable to avoid Java content in your browsers for preventing malicious access to and exposure of your computer.